ESP Auto Inc., Services: Emissions Repair | ESP Auto Inc. Emissions tests can sometimes be confusing for vehicle owners and we’re happy to take the worry out of the process! If your car fails inspection for emissions, most often the codes that are triggered indicate where the problem may be. These codes generally need to be diagnosed in order to determine which component within the system is causing the problem. Diagnostics require different protocols depending on the nature of the problem and systems affected. When you bring your car in for an Emissions Readiness Test, we’ll check the eleven “readiness monitors” that continuously or periodically check your car’s major systems and components. These systems include the transmission, the fuel systems, and the emissions control system and they’ll all be tested under specific operating conditions. Unless the majority of monitors complete their checks by the time the test system connects to your vehicle’s on-board diagnostics (OBD) system, the vehicle is considered “not ready” and will not pass its inspection or re-test. So how many monitors have to pass for the vehicle to receive its sticker? In models from 2001 and newer, only one monitor may report as “not ready” in order for the car as a whole to pass. In cars older than 2001, a maximum of two monitors may report as “not ready” and the vehicle may still be allowed to pass and get its sticker. When we run the tests, we monitor the emissions through a range of different driving conditions to make sure that the components are performing correctly in each situation. The results of those test are stored in the memory of the OBD and, if all’s well, the car’s ready for a state emissions test. In some situations, for the computer to run its required monitors we may recommend a week of highway and city driving to allow the system to re-test and provide an accurate reading of your vehicle’s performance. After the repairs have been made to the vehicle and the monitors have passed, you are entitled to bring the vehicle back for re-inspection at no additional charge. 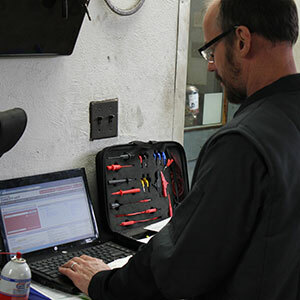 Contact us today if you would like to schedule an appointment to test your emissions system! Learn more about emissions testing here.